Falsehoods and flat-out lies are being peddled when it comes to our electricity grid, in a triumph of partisan politics over long-term policy. Engineer Graham Davies explores the issues and provides some solutions to create a grid fit for the future. I’ll start with a bold claim. Renewable energy is the most cost-effective way to generate secure, reliable, quality electricity in Australia and indeed the world. This claim is based on the assumptions of a whole of life cost analysis – no subsidies and no externalities (“hidden costs”) – in other words, operating on a level playing field. So how could reliable, cost-effective electricity be delivered? This is technically achievable, commercially a little daunting and politically really challenging. 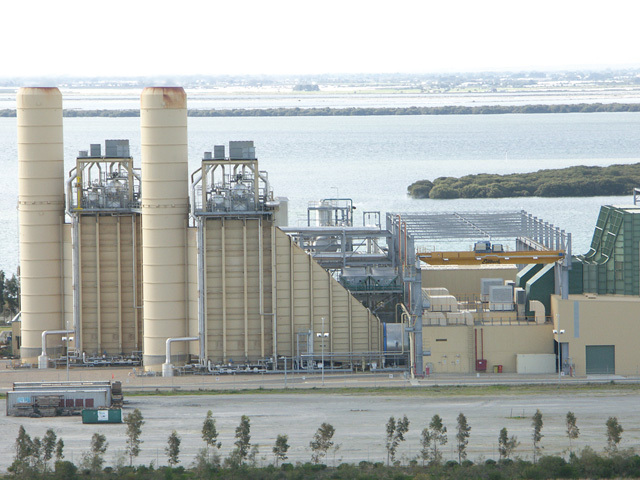 As an example, South Australia could, technically, easily have avoided large outages by simply switching on Engie’s Pelican Point (a highly efficient gas power station); commercially it made sense to do it (allowing the generator to make profits by providing availability to avoid massive public losses – though the National Electricity Market (NEM) distortions resulted in different behaviour); politically it was wild weather, with misinformation and preconceived notions trumping evidence. 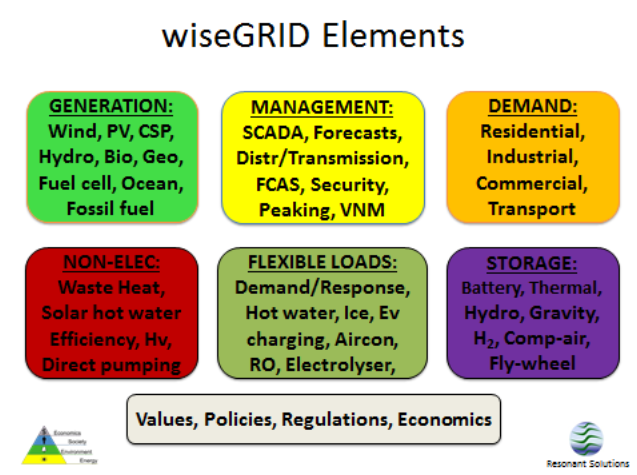 The starting point to an “optimum” grid is to find the “best” configuration of the elements listed in the wiseGRID, pictured below. All options should be on the table, but after preliminary analysis, one could eliminate new coal and nuclear (both too expensive and have long lead times). An integrated wiseGRID model considers the generation type, supply/demand, management, security, storage in the context of what offers best value to society. How many outage hours a year are consumers prepared to have if it brings lower costs? What policies and regulations should be in place so that an efficient market operates? What makes it more difficult is the rapid change of technologies and costs. And one area that requires great wisdom is what strategic infrastructure should be built, even though under current rules it may not appear most economic. Having been involved in nearly all types of generation, I consider it critical that I stay technology neutral, however the distortion caused by current NEM rules does not necessarily encourage the optimal mix of wiseGRID elements. For instance, there is no proper cost on emissions (carbon, NOX, SOX, particulate matter), there is insufficient competition in some regions to allow for an efficient market (for example, SA and Queensland gas generator price hikes), long-term holistic planning is lacking (for example, ageing coal fleets run at low prices because they are already amortised but then suddenly announce closures; political uncertainty) and a clear value on grid stability and reliability is not articulated (for example Frequency Control Ancillary Services (FCAS) – frequency control, voltage stability). Given I’m South Australia-based and electricity is a hot topic, I will use the state as a reference point henceforth. An additional aspect is that sub-regions such as Port Augusta to Port Lincoln/Roxby Downs should also be capable of being islanded. The blackout and high price spikes in SA has triggered much discussion and requires addressing, but unfortunately rampant rhetoric got in the way of fair and reasonable analysis. The AEMO report is reasonable, but an arm’s length assessment is also required. From a governance perspective, it is difficult to self-assess. The Finkel Review is encouraging, and the approach taken is refreshing for the simple reason that it is considering all options and using the criteria of reliability, cost and emissions in order to establish the best path forward. Consultation sessions held have been open and good/robust dialogue. South Australia is obviously strategically important in showing how a high degree of renewables can successfully be integrated into the grid. There have been many “alternative facts” thrown around about SA’s blackout and high prices. Wind in particular has been lambasted, yet it is shown that increasing wind has roughly correlated with a decrease in prices. It was also shown wind turbines can withstand extreme gusts and can ride through, as evidenced in the Waterloo wind farms referenced in AEMO’s report. The December AEMO report shows a number of contributing factors, but is somewhat deficient in explaining why AEMO did not know the cut-out settings of the wind farms (this is mostly rectified now), no mention of structural integrity of transmission towers, or whether there was any structural damage on wind turbines. I was involved in the Philippines in setting modes of turbine operation, and the grid operator sat with us to test reactive power, ride through on voltage and frequency drops. Outages in SA are not excessive, though have been higher due to extreme weather, and prices are not outrageous. A long “skinny” grid is by its very nature more vulnerable than say that of Victoria’s or NSW’s, and as a result prices have always been higher, as transmission and distribution are the bulk of the expense. A reliable secure network would have a mix of synchronous distributed generation, islanding capability, grid-connected microgrids and interconnectors. A combination of fast response batteries, pumped hydro and Concentrated Solar Thermal (CST) energy would (along with a change to AEMO operating procedures and backup generators functioning) have kept most of SA with power. I think it is essential that the 110 megawatt CST plant for Port Augusta proceeds with due haste. This is based on the fact that it has not had the support to get to maturity that other technologies have had, but has every indication that it would be a critical player in the future. It would provide despatchable, clean, synchronous generation in a demographic where the grid is “skinny”. If CST delivers as it should and prices drop, then further deployment can occur. I would suggest that pumped hydro and grid scale batteries need deployment as well as trialling inverter synchronicity. With these strategic items in place, then the lowest cost generation can roll out – at this stage it’s wind and solar PV. Interconnection to NSW or Queensland has merit, but the high cost ($1 billion to $2.5b), line losses and uncertainty over who pays needs to be considered against additional demand management and storage, all of which could also see SA switch from a net importer to a net exporter of cheap renewable electricity. Unfortunately, the “threat” of an interconnector has had a detrimental effect on companies wishing to invest in storage systems, as this would affect their profitability. Gas generation is touted as a transition fuel, but given the lack of competition even with sufficient gas generator capacity, it is not the solution to high prices. As mentioned above, SA is not short of generation, but rather the economic incentive to “switch on” and also not “gouge” (charge at excessive rates by manipulating the 5min/30min NEM bidding rules to maximise generator profit, when a fair profit could be realised). This reinforces why having a renewable grid is technically reasonably achievable, but the commercial realities of a distorted market are inhibiting deployment, because of the NEM rules, vested interests, political uncertainty and cognitive dissonance – facts are causing confusion in some who have already made up their minds! Back to CST. Because at very little extra cost, a CST plant has built in storage (either molten salt or other high temperature medium) the rough levellised cost (LCOE) of 15-17c/kWh seems economically preferable to PV (10-12c) or wind (8c) plus battery (10-20c) and pumped hydro (8-14c). These are rough figures and LCOE is not the only measure to consider, but it is evident that increased deployment of CST would bring costs down further. Other aspects such as longevity, FCAS provision, black start capability, peak shifting, job re-skilling (experience in boilers, steam, turbines, etc, from the coal industry are transferable to CST) should also be considered. The US, Spain and other countries have operational plants as does South Africa with two operational CST plants and four under construction. In time, PV will likely become the cheapest generation source, however, the grid needs to be designed around back feed (allowing local PV to be transformed up to high voltage transmission), and thus a mixed bag of generation is ideal; much like moving from mainframe to networked PCs. In 2014, I raised the question of Northern Power Station’s key demographic position in both a peer review report and a public forum, and what would happen if Alinta closed it. Unfortunately, without Northern, and without having put in place an alternative, there was an extended power failure on “the other side” of the failed transmission lines during the blackout which affected Port Augusta, Whyalla, Port Lincoln and Olympic Dam. Other than a few strategic decisions around a future grid and energy security, each technology must stand up on its own merits based on a sensible economic electricity market. Have demand tariffs and smart meters, such that people are incentivised to switch off at times of peak demand. In other words reduce the “crazy” situation where electricity is generated at $14/kWh and on-sold at 35c/kWh. With reasonable planning and a level playing field, renewable energy would be the most cost-effective way to provide reliable electricity. In fact, long-term, there is no alternative, as we cannot keep burning a finite resource within a finite environment. In fact, it’s not such a bold claim; it’s a bit of a no-brainer! A note on a level playing field and the facts of life: We all want a level playing field, but what is it? I would suggest it’s along the lines of “live and let live”, but clean up your own mess. In the business world, that means considering a whole of life approach and internalising the externalities. This is not always easy to administer, but at least the principle should be applied. “Externalities” refers to real costs that are not paid by the producer, but borne by others in society. These include all forms of pollution, dumping, destruction of shared resource (forests, biodiversity), and of course interference in the carbon and nitrogen cycles that impact on health, wellbeing and environment. In its raw form, it is really a form of theft. It is an incontrovertible fact that our economy and society is entirely dependent on the environment and natural resources. It is thus essential that resources are used optimally and in a sustainable manner – meaning that they are replenished at a rate equal to their consumption. The increasing costs associated with energy that pollutes, produces waste and degrades the environment means that the costs of non-renewables will continually rise. It is only a matter of time before a price is re-introduced on CO2, followed by other externalities including health costs, land rehabilitation, water way clean up and biodiversity loss. Graham Davies is chair of the Sustainable Engineering Society (Engineers Australia) and director of Resonant Solutions.